10,000 voted for Priyanka Chopra in a recent health poll to bag her the title of the Hottest Legs in Bollywood. Priyanka Chopra, earlier this year, was also tagged with the Sexiest Back in B-town. The actress is well-known for her sporty, smart and party looks, recently spotted at an award ceremony wearing a red dress which showed off her well-toned legs. Talking about the accolade, Chopra told Deccan Chronicle, “I am flattered to be conferred with the title! The credit for this goes to my gene pool , my trainers and high heels”. Deepika Padukone bagged no.2 position with slightly less votes. Kareena Kapoor got 3rd position. 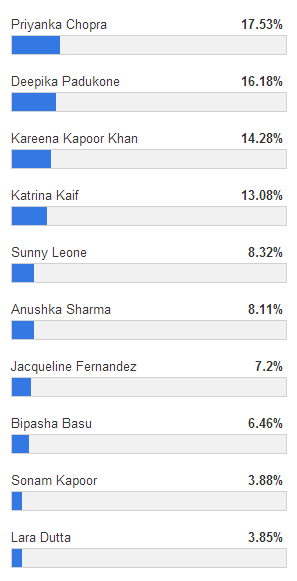 Surprizingly, Katrina Kaif was not in top 3, she was no. 4.